The aim of the paper is to establish the kinetic parameters of the thermal degradation of the organic mass of primary coal tar (PKC) in the presence of pseudo-homogeneous iron catalysts (PGZHK). The paper presents the results of the synthesis of the xerogel of vanadium in the interaction of vanadium pentoxide and ammonium. It is shown that as a source of vanadium pentoxide can be used successfully vanadium carbonaceous – siliceous shales. Using obtained vanadate ammonium in receiving technology of vanadium xerogel is more cost effective process than the use for this purpose the chemical reagent. Integrated use of this unique raw material is a critical component of modern waste-free and environmentally friendly technologies to highlight not only the connection of valuable components, but also the raw material for the production of vanadium xerogels. Synthesized by sol-gel method based on vanadium oxide xerogels with partially ordered highly layered structures already are widely used in various fields of science and technology due to their unique properties. Scope xerogels vanadium: production photocatalysts, composites, membranes and ion exchange materials. The subject of research in this paper is a conveyor drive unit from a conveyor coal transport system that is used by SM "Brod – Gneotino" to SM "Suvodol" (Power plant REK Bitola-Macedonia) because of its existing signs of increased vibrations. Vibration measurements of the drive transporter T5 was obtained to determine the vibration state of the drive unit. Each driveline (electric motor – hydro clutch – gear reducer) has ten measuring points – probes to monitor temperature and ten measuring points – probes for monitoring the vibration of the electric motor bearings and bearings of the gear reducer. Through proper FFT analysis of the vibration signal that has been obtained by the probes we will determine further conclusions and recommendations regarding the state of the elements of the system and their dynamic stability. In this paper the analytical solution of the differential equation, describing viscous incompressible liquid motion through straight round pipe, with one perturbation parameter is given. The perturbation is introduced into the equation through the disturbed viscosity, depending on the temperature. The solution of the corresponding differential equation is sought in the form of a series in the small parameter. Thus the flow reaction to the internal disturbance is studied. The solution, presented in this article, gives an opportunity to further studying the temperature impact on a viscous weakly compressible liquid motion through a pipe. This research may be of interest to the problems of hydrocarbons control flow through main pipelines. In this paper elastic deflections of press frame when symmetric load is applied have been investigated and press stiffness calculated. The commercial FEM package ABAQUS was used to estimate elastic stress and elastic deformation of press frame in case of 6.3 MN hydraulic press. For validation of FE results both axial and radial displacements of the press frame were measured by means of universal displacement transducers. Obtained results are compared and discussed. Our paper’s aim is to emphasis the useful combination between a functional decomposition approach met in literature as FAST Functional Analysis and System Technique – a technique used to decompose logically on levels of abstractisation and ideally solution independent product’s (system) functions and consistent with this decomposition to realize a Failure Modes and Effects Analysis analyze. In this way, for each function inventoried and organized on each detail level there will be associated their specific failure modes. This approach is applied next to a mandrel. in this study, the hard facing with Fe-Cr-C base welded wire and Fe-Cr-Nb-C cored welding wire by using submerged-arc welding method in single-pass, two-pass and three pass over the pieces of carbon steel (St37 )was done. Cored welding wire Fe-Cr-Nb-C by an approximate ratio of 5.41 Cr to C ratio, was containing 5.6 to 7% of the niobium element. scanning electron microscopy, optical microscopy, X-ray diffraction and point analysis, indicates the presence of carbides (Fe, Cr)7C3 and Nb2C in hardened samples with Fe-Cr-Nb-C welding wire. The results showed that with increasing number of hardened passes, the percentage of carbon, chromium and niobium concentrations increased and as a result the dilution percent was decreased that cause to increasing hardness and better performance. test results indicate higher hardness of hardened samples with Fe-Cr-Nb-C welding wire compared to samples hardened with Fe-Cr-C welded base wire. With increasing number of of hard passes, hardness was increased, so that the highest and lowest hardness is related to three pass samples that was hardened with metal cored wire Fe-Cr-Nb-C.The reason of increased hardness in three-pass samples hardened with Fe-Cr-Nb-C metal cored wire was to with increasing in the number of hardened passes , dilution rate was reduced by the base metal and this cause to coarse and more uniform distribution of carbides . 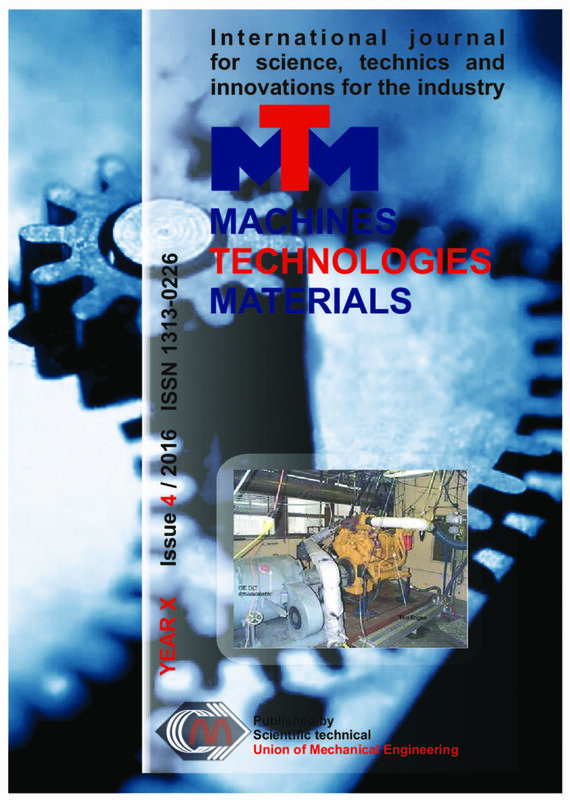 This study aims to optimize the heat treatment of tool steel 75Cr1 which is used for heavy loaded elements in transmissions. A salt bath was used to quench and temper the steel at different temperatures. Mechanical tests and microstructural characterization were done to define the heat treatment parameters corresponding to the optimal performance of the elements. Optical microscopy, electron back scatter diffraction and x-ray diffraction were used to characterize the microstructure, while tensile tests and toughness tests were employed to determine the mechanical properties after different heat treatments. It was found that the yield strength decreases with increasing annealing temperature and that the toughness decreases with increasing annealing time and temperature. The changes of the mechanical properties are discussed in relation with the thermal treatment and the corresponding microstructures. The analysis of stress-strain state of the bisector of the corner of the blank at a drawing of box-shaped parts. Analytical dependences for the meridional and circumferential stress on the bisector of the angle. It is shown that an increase in the limit drawing ratio compared with an extract of the cylindrical part is a consequence of the growth in absolute value of district compressive stresses. It was found that the maximum value of the coefficient of drawing of box-shaped parts cannot exceed the value of – K=exp(1+1/√3)≈ 4,84. In the article is considered traffic management system in urban networks. Presented analysis of the criteria in the transport network management techniques. Showed results achieved in the implementation and management of traffic flows in the cities, their advantages and benefits. Development of mathematical dynamic models for calculating working parameters of the transport unit allows t create a well-functioning traffic management system. These systems allow to solve optimization problems, to regulate traffic flows in populated areas, thereby allowing the full potential of the existing route network, as well as it will ensure an adequate level of safety, convenience and efficiency of transportation with the least environmental impact. In view of the new realities created by signing the Association Agreement between Georgia and the European Union, Georgia for the first time was given the opportunity to be properly involved in the processes of global economic integration. This problem can be successfully resolved through safeguarding the Euro-Asian transport-communication space – “A New Silk Road”, and in the conditions of harmonizing the country’s geo-economic interests. It should be noted that the first test train has passed already through the Georgian section of a new Baku-Tbilisi-Kars railway line. This section is what should become a component part of “A New Silk Road”. The construction of 180 kilometers of this railway line has been already completed, and now everything is being done for completing all works by the end of 2015. This railway line is considered as the most significant project in the South Caucasus region of the Euro-Asian transport corridor. When the internal combustion engine operates there are arising forces acting on the supporting elements, and by both value and sign they represent variable forces. They vary depending on time, depend significantly on load conditions of engine and are characterized by different vibro-frequency energies. These energies are unevenly distributed due to fact that the engine design comprises the elements having inertial, flexural and dissipative properties, frequency characteristics of which often vary within a wide range. The paper describes the method for determining frequency characteristic of vibro-energy transferred to the frame by introducing the vibro-energy transfer coefficient, which allows for determining frequency characteristics of vibro-energy transferred to the frame, on the basis of which, in turn, it becomes possible to determine efficiency of bearing shoes.